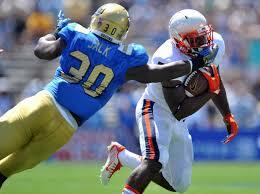 LB-Myles Jack, UCLA, 6′ 1″ 245 lbs. Cons: How soon will he be fully recovered from his serious knee injury? He might be at full strength by the start of the season or it could take until next summer. The former Bruin is a little short for an outside backer and isn’t know for being a hard hitter, especially against the run. Jack sometimes gets caught up in the wash near the line of scrimmage, and is unable to shed blockers leaving him weak at the point of attack. The line backer gets very handsy in coverage, so he will be forced to dial down his aggression in the NFL. Even when he over-pursued , the backer is has enough athletic gifts to make up for it; but that might not be the case in the NFL. Pros: This extremely athletic linebacker has light feet and great fluidity. He is very instinctive, breaks down quickly, seeing and anticipating well. Jack is a solid wrap-up tackler even in the open field, but prefers in tight quarters to run around or hurdle over blockers to get to the ball carrier instead of taking them head on. When attacking the edge, the backer creates pressure forcing quarterbacks into ill-advised throws. His motor is constantly running and will give chase 20 to 50 yards down the field, never giving up. Overall thoughts: If fully healthy, Jack could wreak havoc on NFL offenses, scoring major fantasy points. Not at a J.J. Watt level, but enough to make a difference in balanced IDP leagues. I would consider him in the early second round of rookie drafts if he can run at full speed by the time your draft is held. « Dak Prescott: Improved, but will character get in the way?